I’m thrilled to announce that full language support (English, Spanish, French, German, Russian, Chinese and Japanese) has been rolled across the new user interface. If you would like to contribute a native translation for MPEmbed in your own language, you can use the Premium Language Tool to translate all UI elements and send the space to me — I’ll integrate your translation! So far, we have a partial translation for Polish (&lang=pl). Hopefully we’ll see more soon! Custom Mattertag sort order & organize by folder is working again. Disabling Social Media sharing in Workshop now recognized. Disabling Guided Tour Play/Pause in Workshop now recognized. Fonts look much better in Firefox. Flip Button works in both normal and upside down mode. Added a Help Pop-Up to UI 2.0 – It’s simplified and I think that the verbiage is more direct. It is only in English right now (but you can edit the text in Premium). Added additional multi-lingual translation words. As a note – the UI disappears completely during highlight reel playback. This was intentional, but some users may want this to be optional and I’m looking into it. 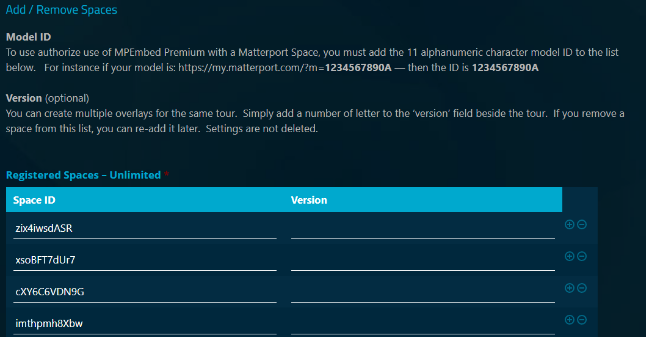 &brand=0 can now be used, as it can with Matterport Showcase, to not show the ‘Presented by’ information when loading your space and in the MPEmbed details panel. I’m thrilled to launch the new MPEmbed User Interface. On the surface, you might not notice any changes. Under the hood, the possibilities are endless and I have been able to immediately address some issues that I’ve had since the beginning of the project. I'm thrilled to launch the new MPEmbed User Interface. On the surface, you might not notice any changes. Under the hood, the possibilities are endless and I have been able to immediately address some issues that I've had since the beginning of the project.The length of the about panel tabs now adjusts when the highlight reel is open.All UI elements fade and return at the same time. You can even completely turn off the fading interface if you'd like.All UI elements disappear during guided tour mode. This is GREAT for recording a screen capture!The flip button, compass button and user copyright are all now fully integrated into the footer dock. They move, scale and resize with the user interface.Scale UI now features all buttons including the floor selection and social sharing.The Social Share links now share the actual page that the tour was embedded on. If it's a direct mpembed.com link – it'll share the MPEmbed space!–And if you saw the sneak peek from the other day … yes! We're even closer to being able to roll out the ability to add custom content to the highlight reel! Responsive About Panel and Highlight Reel – The height of the about panel automatically changes to allow the highlight reel to be open and extends when it is closed. Sharing Buttons Share Your URL – Now the sharing buttons in the UI will share the actual URL that your tour is on — not the bare my.matterport.com url. This means that sharing buttons now share MPEmbed links — or if you are embedding this tour on a WP3D Models page or your own website, it will share that website. Be advised, if you are sharing a link to your own website, the image and text that appears will be sourced from your website. Responsive Compass (Premium) – The compass now moves up when the highlight reel is opened. Full UI in Scale UI (Premium) – All controls are now available in scaled UI mode including larger controls! Aligned Flip Button (Premium) – The horizontal flip button is now aligned next to the floorplan button on the bottom left at all times. Full UI in Flip Mode (Premium) – All controls in flip mode. When using ‘horizontal flip’ mode, you will still have the highlight reel (all images flipped! ), floor selection and share buttons. New Mattertag Icons – Replaced YouTube icon with video icon. Replaced ‘play’ icon with ‘pictures’ icon. ** Requires use of MPEmbed’s About Panel. If no about panel options are enabled, the default Showcase About Panel will display and behave normally. MPEmbed is now awesome on mobile devices with a new responsive layout. The Minimap and About Panel no longer have a turf war and keep to their own corners! MPEmbed is now awesome on mobile devices with a new responsive layout. The Minimap and About Panel no longer have a turf war and keep to their own corners! You can now set the default orientation for the minimap with MPEmbed Premium! In addition, if you would like to allow your users to freely rotate the minimap, you can enable the minimap rotation tools that will appear below the zoom functions. All Hotspot and Mattertag labels are automatically reverse rotated so that their functionality remains in place! You can now set the default orientation for the minimap with MPEmbed Premium! In addition, if you would like to allow your users to freely rotate the minimap, you can enable the minimap rotation tools that will appear below the zoom functions.All Hotspot and Mattertag labels are automatically reverse rotated so that their functionality remains in place! Now you can choose a single column, double column or 4 column layout instead of the default 3 column layout! Have you ever setup an amazing space with MPEmbed, but then needed to reupload the space with some additional scans or changes to your window markers and trim? You can now start enhancing your initial upload — or safely swap between versions of the same space by using MPEmbed proxies — without ever needing to provide your client with a new URL! Introducing Proxies. If you've reuploaded a space and would like for the new space to appear in the place of your old space — retaining all of your MPEmbed settings – you can now do this!Your URL stays the same — your settings stay the same! When a user clicks on a Mattertag in the Mattertag Directory, MPEmbed uses the SDK’s ‘navigateToTag’ feature to ‘fly’ to the Mattertag. Unfortunately, if a clear line of sight cannot be established, this fails. MPEmbed has been mitigating this problem for a while by zooming to dollhouse mode (or floorplan mode if dollhouse mode is unavailable) and then reattempting to ‘navigateToTag’. Generally this works. It works for me every time, but others have reported that it does not work for them every time. A while back, I added in an experimental ‘alternate’ 3D Transition for the Mattertag directory. To be honest, I completely forgot about it. This transition uses some mode swapping quirks in order to more reliably navigate to the tag without the dollhouse / floorplan mode change. Based on feedback, I have replaced the old method with this new experimental method. It has, I suppose, graduated! When a user clicks on a Mattertag in the Mattertag Directory, MPEmbed uses the SDK's 'navigateToTag' feature to 'fly' to the Mattertag. Unfortunately, if a clear line of sight cannot be established, this fails.MPEmbed has been mitigating this problem for a while by zooming to dollhouse mode (or floorplan mode if dollhouse mode is unavailable) and then reattempting to 'navigateToTag'. Generally this works. It works for me every time, but others have reported that it does not work for them every time.A while back, I added in an experimental 'alternate' 3D Transition for the Mattertag directory. To be honest, I completely forgot about it. This transition uses some mode swapping quirks in order to more reliably navigate to the tag without the dollhouse / floorplan mode change.Based on feedback, I have replaced the old method with this new experimental method. It has, I suppose, graduated! GravityForms is a form building and data management plugin that is crazy amazing. It allows rapid creation of interactive forms with almost endless extensibility — perfect for building custom administration areas with. I’m thrilled to have installed a fresh copy of GravityForms including a bug fix that resolved an issue with MPEmbed’s Premium Control Panel that had appeared on the latest release. I had rolled back GravityForms to an earlier version to avoid the problem. I use the ‘list’ field to power the Add / Remove Spaces section in the Premium Admin. This quirky use-case allows users to have a repeating, and sortable section for adding space IDs and adding version numbers if needed. The data is saved via JSON, which MPEmbed Premium is able to quickly pull from the WordPress Database to verify that the space is enabled. I love it! I can add additional columns if needed too. As RocketGenius is building infrastructure for a more powerful ‘repeater’ field group system, the lists seemed to have been affected. It is likely that they are being rebuilt as a subset of the repeater field. What I am VERY excited about is that I should soon be able to gracefully transition the list field into a more integrated ‘Add Spaces’ form that will allow me to build other features in – such as the addition of ‘MagicTags’ and other space-specific content that will be shared soon! I’m applying custom image filters & they look great but I can’t get them to stick. Anytime I move to a new scan point it resets to the original colors… What am I doing wrong? Fixed – Disabling a color filter would not unapply visually while working in the Premium UI. Change – Disabled color filter animations from appearing on the entry panorama. Better this way! Improved – Custom Filters are now displayed at the TOP of all selection boxes in Premium — not the bottom! In addition, I’ve added a support contact form to the Premium Control Panel to encourage all users to reach out to me when there’s a bug! MPEmbed’s Account System runs on WordPress with GravityForms. GravityForms is pretty awesome and allowed me to rapidly build all of the user sign up forms, the payment processing forms, and even the form that lets you add spaces to use with MPEmbed. I’ve used GravityForms for years — it’s been a great friend. GravityForms v2.4.1 came out and pulled a fast one on me (and a few of you!) If you opened up your Add Spaces panel and saw nothing there — oops! I’ve rolled back to the previous version of GravityForms and filed a support ticket. Until it’s resolved, I’ll keep the downgraded version. I’m happy to announce that the drop down lists in the Mattertag and Highlight Panels have been removed and now both mobile and desktop versions of MPEmbed have a unified interface. I’m not happy to have discovered that MPEmbed’s free version was not working at all for mobile. When a space was entered, all MPEmbed parameters were dropped. While the space still loaded perfectly, the overlay was not appearing. This has been a problem since Premium users were provided the option to set all standard Matterport parameters from within the Premium interface. If you are having difficulty with MPEmbed or find a bug, please do contact me immediately! Many of the new features are a direct response to user feedback and most bug fixes are an immediate response to valuable feedback from the Matterport community. In the near future, the Minimap will be reimagined for mobile. I have several ideas such as providing options for customization of the mobile version of a space separately, and / or the mini map opening up as a full screen overlay for mobile so as to not overlap with the about panel. The conflict of the about panel and mini map while in portrait orientation has been a pain point since MPEmbed has launched and I would love to resolve it! On the Subject of Bugs…. The ability to hide Mattertags on Dollhouse, Floorplan, and/or Inside modes has now been labelled as a (BETA) feature as I have received and investigated reports that it causes media that is embedded within Mattertags to not appear. Mattertag Category Lists are live! You can now create, sort and build category lists to organize large numbers of Mattertags! This new feature has been one of the most requested additions since the launch of Premium! In addition – a longstanding bug that sometimes caused MPEmbed to fail to load has now been resolved. I was using Matterport’s sample SDK code for initializing the SDK, which inherently had some issues. One being that if Showcase lost focus, or you are jumping between applications or windows while Showcase is loading, the SDK would fail to load! I’ve swapped the load method for a jQuery one and it’s rock solid! I am thrilled to finally get past that one! Take even more control over the about panel! Now you can set the default panel that shows upon load – regardless of the order! In addition, users can now open and close panels. By popular request, I’ve added a simple. embed code generator. You will find the friendly green ‘Embed’ button at the top right of the premium editor. Improved Filter Management is here! You can now remove (and unapply) custom filters with the handy trash icon! Previously, overwriting them or just accepting their existence was your only choice :)Additionally, you'll notice a friendly green 'Embed' button at the top right. By popular request, I've added a simple. embed code generator. If you’ve noticed the title of your space not appearing in the browser title, this has now been fixed. In addition, if you are using a custom minimap, you no longer need to use &minimap=1 — it’s assumed and automatically switched on. Finally – when using custom copyright (&copyright) and using Spanish, German, French or Russian text (&lang), the copyright is now correctly positioned. Some users take advantage of being able to set parameters for MPEmbed by using hidden mattertags. If you’re not use the Premium version, it’s a great way to avoid a long URL full of parameters – and a great way to be able to change options after your client has already published their space. One of our users emailed me because MPEmbed was not loading. I realized that one of his Mattertags had the title ‘info’ – for some useful information that he was displaying in his tour. This is a parameter that MPEmbed used to use (still supported, but it’s deprecated — and has been replaced). In order to fix this problem, MPEmbed is now ignoring visible Mattertags. Only hidden ones will be used for parameters. The current position marker on the minimap now moves with you between panos! It’s a little delayed as it depends on the rate that and speed that the SDK updates us with this information… but it’s pretty fun to see! The current position marker on the minimap now moves with you between panos! It's a little delayed as it depends on the rate that and speed that the SDK updates us with this information… but it's pretty fun regardless!